Water Jetters, Sewer Jetters, Drain Jetters! For the past twenty years, Steamaster has been selling various types of cleaning equipment, with 5-star reviews from happy customers. They offer a wide range of products that help clean gutters and sewers with high pressure water, effectively. Steamaster offers water, sewer and drain jetters, along with High Pressure Washer, Jet Blaster Drain Cleaner, Drain Cleaning Machine and Hydro Jetting Equipment. These are fitted with petrol engines, making them powerful enough to deal with the most stubborn sludge and debris. The equipment from Steamaster has been designed specifically to handle such tough situations and reduce cleaning time and the cost, significantly. How Do Water, Sewer & Drain Jetters Function? Drain and sewer jetters use highly pressurised water that is forced through a nozzle attached to the end of a long hose, which is inserted into a pipe. With a powerful pump, the water is ejected through the nozzle, at high pressure. As the water is pushed through the nozzle at high pressure, the sewer and drains cen be easily unclogged. The Water, Sewer and Drain Jetters have both commercial and industrial applications. 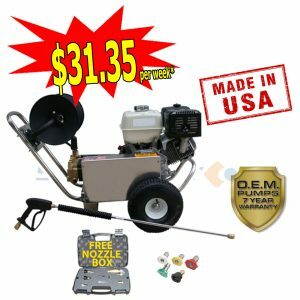 Plumbing professionals can also use this equipment to clear out large areas in a short span of time. What are The Benefits of Water, Sewer & Drain Jetters? Using this equipment to clear clogged drains is cost-effective. With this range of equipment, you do not need to replace the pipe completely. The portable design of the equipment makes it easy to carry even in the car. The jetters help clean clogged pipes without the use of chemicals. These devices are designed to be tough and long lasting. 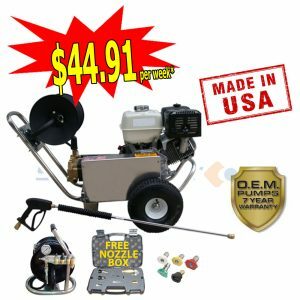 Steamaster’s Water Sewer Drain Jetters are high on productivity, but low on pricing; and with such a huge range of jetters at your disposal, you surely would have one to suit your purpose. Hurry! Grab yours soon!